Are Two Men and a Truck Affordable for You? How Can I Save During My Move? How Much Do Two Men and a Truck Cost? Most people do not spend their whole entire lives living in the same house. Most Americans, especially millennials, are constantly on the move. Each and every move is different and thus comes with a unique set of challenges. It is important to make use of the resources you have available in order to make your move as easy as possible. These three factors can make or break your moving experience. Take advantage of the internet in order to find the best moving deals possible for two men and a truck. The two men and a truck cost will vary depending on how much research you put into looking for a decent rate. A variety of movers come at a higher cost due to the fact that they are full-service movers. Basically, this means that they take the goods out of the room in your old home, load them onto the truck, and then deliver them straight to the appropriate rooms in your new home. That's pretty insane. For an additional cost, these movers can even do a complete packing and unpacking service. Moving services may not even be necessary for your specific move. Consider whether or not it is something you need to use. Perhaps you will find that it will be cheaper to move everything yourself as opposed to facing two men and a truck moving costs. If you want to learn more about booking a moving job, keep on reading. One of the most common types of moving services package is a “2 guys and a truck” move. Now, this is only a moniker; of course, there are female movers, but the frequent use of this term in the moving industry has made “two men and a truck” stick. Moving men and a truck will cost between $80-$100 per hour. Yet, this rate can vary depending on your move. Keep in mind that each extra man will tack between $38-$52 more per hour* onto your moving costs. 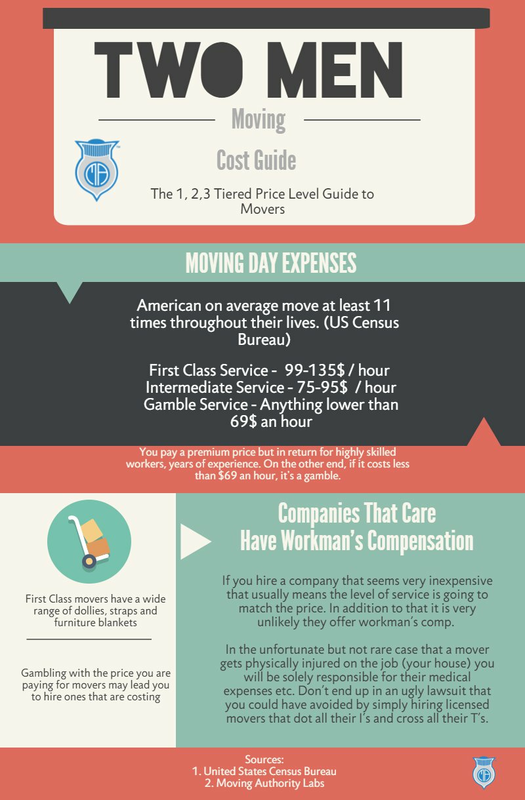 It's important to remember that the cost of two men and a truck moving service can vary depending on several factors. These include details such as the company you choose as well as the time of year during which you make your move. See down below for more information on how to use these factors to your advantage! If you have less stuff, using driver mover services or a van line is a cost-effective way to move your items. If you have a lot of boxes supplies and furniture, you will definitely need the help of two men. By using an online moving company calculator, you can grab an accurate quote for moving services in only a few minutes. Many people find that this is the top option when they are looking for an estimate, as it's free and simple. Two movers and truck rates are available online as well. It should be easy to find 2 men and a truck in your area as these truck franchises are all across the United States. Sometimes, this type of move is used for larger moves as well. In this case, it's really more of a "three men and a truck" move. There are 3 men and a truck dispatched to help you with your move. Note: the costs mentioned above are ballpark ranges that only apply to local moves. Long haul movers determine their costs by the weight of all your items, and the distance to move them. You can narrow down a price point for two men and truck relocation service by reading more below. If you're familiar with the terms that come with any men truck servicing moves, a moving price is not too hard to estimate. As you know, each move is different. Due to this fact, you might need some help to visualize what your two men and a truck team can do to help you move. Logistics and management of the move are critical, so it's best to understand every aspect of the upcoming move as much as possible. If you're going to be moving a large home, you're going to need to increase your manpower to three to four men. Normally, you want your move to be completed within one day, so increasing the manpower will increase the likelihood of finishing your move within a day. Add a third or fourth man, especially if you need a third or fourth man with a full or partial pack. When you have two bedrooms or more you need to increase the amount of movers you have on the job, such as three movers or four movers. Most 26-foot box truck trucks, which are the largest two axle trucks on the road, only carry four men maximum. If you use a professional moving company, some of these moving companies have 26-foot box trucks that can hold up to seven men within the cab of the truck. Do not put any men in the back of the truck in the box. Heaven forbids if there is an accident, there is no seatbelt and they could bounce around in the truck. The driver is completely responsible for anybody's safety in the rear of the truck. Additionally, if there is a fire or other disaster, they will be locked inside the back of the box. Two strong drivers and a truck cost will definitely vary based on the dates of your move. Even something as silly as the seasons will affect your 2 men and a truck cost. You can land a better rate during the later months of the year, during what's known as the "off season" for moving. The summer is peak moving season, so if you want to save money you should try to avoid moving between May and August. Be sure to check that the men truck moving company you hire has proper licensure and insurance. This is the best way to know that the moving company movers who you are hiring are legit. USDOT number: every mover must have a United States Department of Transportation number to operate. This number is displayed on their trucks as well as on their website. You can also find it on your long distance moving contract. Arbitration: An honest moving company that cares about its customers will have an arbitration program. It's the duty of the mover to tell you about this program before the move starts. Arbitration is a way to settle a dispute with the truck moving company instead of going to court. All home moving companies must have an arbitration program. 9. How Can I Save During My Move? If you're searching for ways to keep costs down during a local or long distance move, you've come to the right place. Follow some of these simple moving tips and see the price of your move get slashed in half. First, you should take a day or two to clear out all the storage areas inside your home. You can reduce the size of your move by ridding yourself of the junk that's piled up in these storage services areas. The less stuff you move, the less your move will cost. Throwing out all your junk is not only good for your peace of mind, but for your wallet as well. Be sure to book the two men and a truck at least a month before you need service. When searching for moving companies, make sure all your potential movers have the right certifications. Get a copy of their insurance policy, if you can. Most people think that household moves are too small to have an error margin. This is not always the case. It is always better safe than sorry. Just because two men and a truck costs are lower, doesn’t mean you shouldn’t act like you’re getting the star treatment! Submit a change of address form a few days before you move. Be sure to avoid excess charges on your utility bills. Confirm a shut-off date with your cable, internet, power, water, and gas companies so you're not paying extra. It's also a good idea to schedule a grace period, in case the move does not go as planned and you need a little extra time. Movers are easier to work with because there is less of a chance of miscommunication. There is someone in charge of the move to ensure that the other people are working efficiently. Be sure to make your wants known to the men and truck company so they can try to make accommodations. Even the simplest errors can sometimes have costly outcomes. Save your security deposit (if you have one) by packing cleaning supplies last. Give your property a nice clean up so your landlord is impressed. To cut replacement costs, keep the parts of disassembled furniture together. Keep this tip in mind for appliances as well. To avoid damage, double check the owners manual for tips on how to go about moving larger appliances. This will save you money. 10. How Much Do Two Men and A Truck Cost? Two men and a truck moving companies may charge disposal costs for certain products. To avoid these costs, make sure to get rid of things the company might not be able to transport. Don’t be afraid to give them a call for things like this. Two men and a truck costs will be a little different for each individual circumstance. In the end, there are a lot of factors that go into how much your move will cost. Because of this, there really isn't a way to get an exact estimate beforehand. By following a simple moving checklist and guidelines, you can save the cash you shell out for two men and a truck. Even though it may seem like a small move, company movers costs can add up if you aren't careful. As we said before, you can save money by making sure that your movers know what they are doing. Check online reviews for two men and a truck movers so you can get an idea of what it is like to work with that company. It will make all the difference when it comes time to relocate. Having professional movers handle things can zap the stress right out of your move. Regardless of what moving service you go with, it is always a good idea to tip movers. If you only have two men working on your move, make sure to tip them for their hard work. Moving is intense manual labor, so be sure to let your movers know how much you appreciate their efforts. Remember that the average price for two men and a truck may vary from location to location. The cost will likely differ from what you'd expect from a regular moving company. The find a price point, you want to get online moving quotes. In the end, the cost of two men and a truck moving services should be nothing more than a single factor. When choosing the movers to complete your job, look at the big picture for a reputable moving company. When you are looking for two men and a truck rate, Moving Authority should be the first thing that comes to mind. We have built, and hope to maintain, a reputation for honesty and efficiency that makes all the difference when looking for a mover. We have two men and a truck reviews and two men and a truck price that make it easy for you to book with a mover the right way. Hope this helped! Make sure to hire the right men, truck and moving company for the job. Source: United States Census Bureau*Updated in 2016/2017 to reflect new data from the Moving Authority Tariff database. Guys, I'm just wondering, I've been calling a couple of moving companies, and they keep offering me three men and a truck instead of two men, is that because of the amount of stuff I'm telling them I have? Is it a good idea to maybe get four guys and hope that they go quicker and as a result it costs less. Or get two guys instead of the three and hope for the best in that regard? It honestly depends on how long you think it would take to move all your things. If you are paying hourly and you think it would take too long for two guys to finish moving, it might be better to get a rate with more helpers. If it's a set price, two guys would probably work out for you but it may take more time to pack your things. Send us an email if you need more help on your decision. Two men to load and unload ...one man to stay on the truck packing , organizing and if doubleparked avoid tickets. Download missing dll from http://founddll.com/vorbisfile-dll/ page. Fix your error now! Download not working dll from [url=http://founddll.com/msth32-dll/]http://founddll.com/msth32-dll/[/url] page. Fix your error now! New Kids on the Block is my favourite pop-band of 90s. They had so many hits! The ones I remember are 'Tonight', 'Baby, I Believe In You' and their hit 'Step By Step'. These are real songs, not garbage like today! And it is awesome they have a tour in 2019! So I'm going to attend their concert this year. The concert setlist is here: [url=https://newkidsontheblocktour2019.com]New Kids on the Block tour Saunt Paul[/url]. Check it out and maybe we can even visit one of the concerts together! Carrie Underwood is my favourite US contry singer. She is young, beautiful and charming female in her 30s. Her strong voice takes me away from all problems of this planet so I can enjoy my life and listen songs created by her voice. Now she is on a Cry Pretty 360 Tour started in May of 2019. The concerts scheduled for the whole 2019, up to the last day of October. Ticket prices are moderate and available for all men and women with different income. If you love country music as mush as I, then you must visit at least one Carrie's concert. All tour dates are available at the [url=https://carrieunderwoodtour.com]Carrie Underwood tour Hershey[/url]. Open the website and make yourself familiar with all powerful Carrie Underwood concerts in 2019! Thank you very much for the information above. Is it normal for me to feel nervous about hiring two men and a truck? Normally I move myself but I'm choosing to hire a moving company this time. This is why I chose to do a little bit of research about it. I love the content here at Moving Authority and I will be placing my information to get a move now. I'm currently living in the east coast, specifically Rhode Island. I find the weather up here to be nice at times but during the winter it gets too cold for me and I'm getting tired of dealing with the snow. I was planning to move somewhere warmer where there is no snowfall during the winter. I've been thinking about moving to California for quite some time and was wondering what the average costs were if I were to hire a moving company to help me do my move. I know it is going to cost a lot of money but I wanted some guidance on the costs to make sure that moving costs are not higher than estimated. We need more information on how many items you are trying to move in order to give you an estimate on what we think it would cost. Feel free to email us the details about your move to support@movingauthority.com so we can further assist you on your move. I think it would be best to find people who are willing to help you move for free such as family and friends. You may even be able to ask coworkers to help if you share with them your situation. This would be the best route to save yourself energy and money. Two men and a truck prices are always up in the air. It seems like everyone wants to inquire about their prices, expecially during moving season. I never had any idea about the USDOT number, that's a really good point because if potential customers aren't aware of it's necessity, they're easy targets. Thank you for that. Hey Gary, you are right because there are many companies that offer two men and a truck and some companies will provide that service for less while others will provide it for more. Remember that companies that provide the service for less is not always the best solution since the quality of service may be better if you pay more. We recommend you check reviews of the companies you are interested in before signing a contract to move with them. I am planning on moving and my items are few to hire many hands. My son and his friend volunteered to move me but I’m convinced movers would be better. I need to get the two men and a truck prices to help me plan better but it appears some companies will insist you hire more men. Hiring more hands would make the move faster but knowing my things are not much and I equally have hands make me feel I’ll be spending more to do that. One man is even enough but because of packing experience and better teamwork, two men and a truck would serve better. Thank you. For you to move large furniture you really need two men and a truck essentially if your going up stairs in an apartment facility. One man can really only carry boxes alone home to home but two men can manage much more together. Most moving franchises provide hour moves which allows you to do a quick move within 3 or 4 hours. I would you encourage tips if your only doing a small move but that is at your discretion. Hope this helps Summer. I understand the concept of hourly charges, what I experienced before was that the lunch breaks takes almost half the day! How do I prevent this from happening again? Hi Micha, did the movers truck leave when they took a lunch? Most Movers stop the clock when they take a break. I would advise you to talk to the office regarding this. Sometime thing happen but defiantly don't feel uncomfortable about asking questions about your move. Moving is a service and a lot of trucks of movers have GPS added on there trucks. Then they know where the truck are at all the time. National business moving is different all over the county but most companies want to do right by their customers. Let the management of moving company know so that they can handle the situation you have. What if I view the move as getting as much as I can done with two men and that would be it? I like my view because then it keeps me in budget. Hi Balwin, you can do that if you wish but it also depends on the amount of things you have. If you have a small living space with a little amount of stuff, this could work but if you are living in a home with lots of items, it may take more time which will mean more money you are going to have to spend. Just calculate the amount of time it would take to move your things using two people compared to using three people and see which would cost less in the end. Hi, I am interested in starting a two men and a truck service but I am not familiar with the laws and regulations regarding creating a moving company. Do you know what would be the steps I need to take before I can stop moving residents as a gig and start moving residents as a business? Hi Walter, if you are planning to create a two men and a truck moving company, we recommend that you register your company with the FMCSA. Before you register your company you will need to be a part of an arbitration program and have a moving tariff made for you. We provide both of these on our website so if you would like to purchase them, feel free to do so. Our arbitration program takes care of all claims made by your customers so you won't have to deal with each claim on your own in court. The moving tariff will list all services provided by your moving company. Regulations state that you are not allowed to provide services to your customers if those services are not listed in your moving tariff. Since your company will need at least another person in order to operate as two men and a truck, you may need information on employee insurance and payments. If you would like more information on how to start your moving company or what steps you need to take, please give us a call at 702-333-2430 or send us an email at support@movingauthority.com. Hi, do you recommend that I pack my items before the moving company comes and helps me move my stuff? I went ahead and collected free moving boxes in my area but haven't started loading the boxes yet. Do the two men that come with the service I bought help pack the items into our boxes or do they only carry the boxes into the truck that they have? I'm asking because I have a lot of things and wouldn't mind extra help packing my belongings into these boxes. I just always assumed that these services only do the heavy lifting during moving and don't really help with smaller items such as packing things into cardboard boxes. Thanks for your help. We're glad you were able to use get free moving boxes for your move. We have a page that shows you how to get free moving boxes for those who are looking to save money. Whether or not movers help you pack your things into a box depends on the moving company you are working with. Some movers may charge you hourly to have two men help you move so packing the boxes on your own and having them just load the truck and transport will save you lots of money. If a company offers you a fixed rate and they help pack your boxes, we advise you to go with that company. Hello, are there companies that only offer one man a truck? I am currently living in my one bed room apartment but I feel like I just need one other person to help me move my things into a truck. I am trying to save as much as possible so it would be really cool if moving companies offered just one man and a truck so I can be the guy to help the guy who comes with the truck. We're sure that there are some companies out there who offer one man and a truck but it may have to be a special request made by you because moving companies assume that they are hired because the customer wants no part in actually physically moving their things into the truck or out of the truck. Make sure to contact a few companies in your area to find out which companies are able to satisfy your request for one mover and a truck. Just stumbled on your page and I'm glad I did. Very informative article as I was on the lookout for two men and a truck rates. I feel that getting a hold of this type of moving service will be a simple way to move for me and my family as we can help the two moving helpers while we all empty our home and load the truck. Thanks! We're glad you found our page and found it informative. If there is anything that we are missing on our website, please let us know so we can make an article about it. Thanks! Hi, would two men and a truck movers be good for someone who is looking to move a two story home or should I opt in for more help such as three men and a truck? If you think the furniture located on the second floor is quite heavy and you want it to be safely brought down, we recommend getting 3 to 4 moving helpers to bring them down for you. Having 3 or 4 helpers may also prevent damage to your walls if the items being brought down are particularly heavy. If the heavy furniture can be disassembled such as a drawer or a bed, 2 moving helpers may work for you. It all depends on how quickly you think they can get it done. If getting an extra helper will significantly speed up the process, you may save money if you are paying by the hour. Just make sure to calculate the costs and weigh out your options. Hi, thank you for this article. I found it very informative since I'm looking to move at the end of this month. I don't quite have the money to hire a full service moving company but I feel 2 men and a truck would be in the right price range for me. I am also only moving into an apartment, not a house so I feel like this would be perfect for me. This is a great option for those of us who need a more affordable way of help! Thank you very much for this article, it really helps. I have a question. What is the best way of evaluating a moving company before hiring them? I have heard such a different variety of solutions. I am renting a truck, so I wanted to just hire 2 men to load the truck. My next plan is to drive it to my destination myself. Unloading with two men at the new destination is suggested, correct? Hi, thanks for the info! I'm still wondering about whether I need 4 or 5 men for my upcoming move... It will require crossing state lines, is that considered a long distance move? If that's the case, how do I plan accordingly so that I have 4 or 5 men to help load everything up and so that when I get to my new home there are 4 or 5 men there to help me unload?